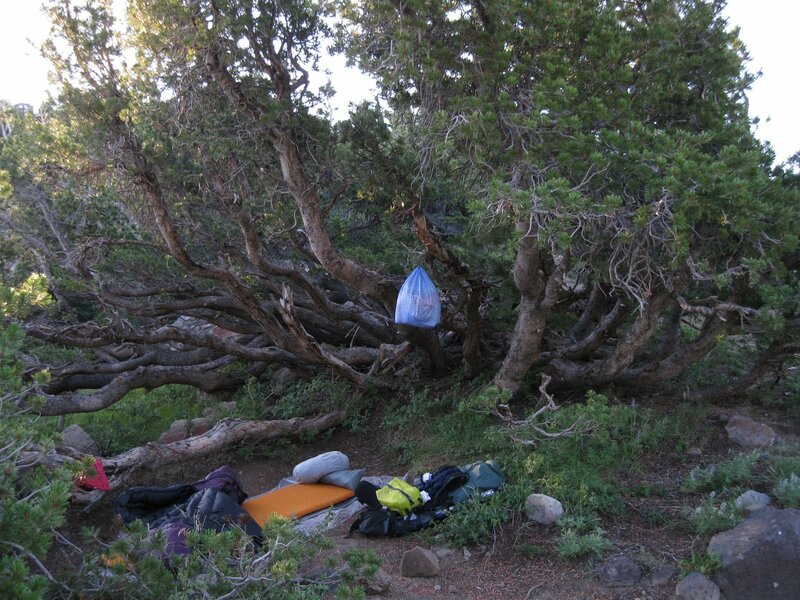 Trees in the morning–a whitebark pine over my bedsite. 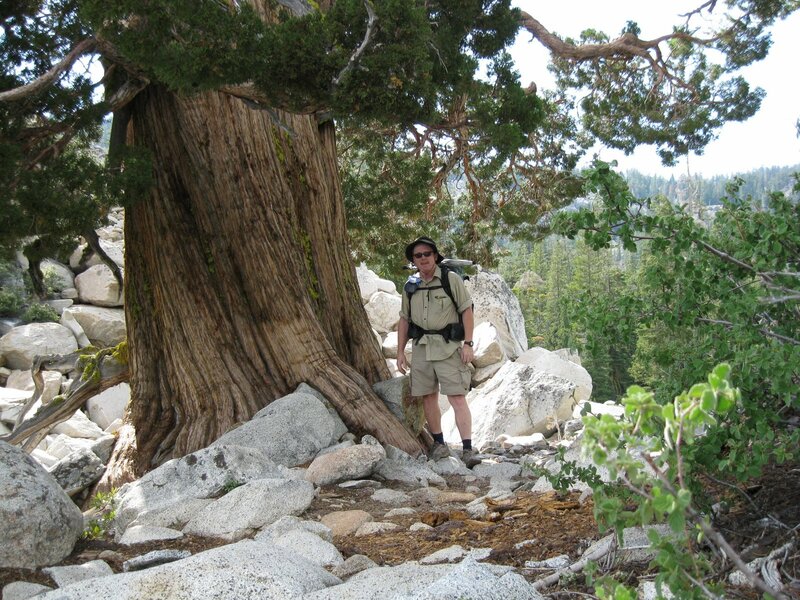 Trees at midday–a western white pine anchors my lunch site on a granite knob in otherwise volcanic terrain. 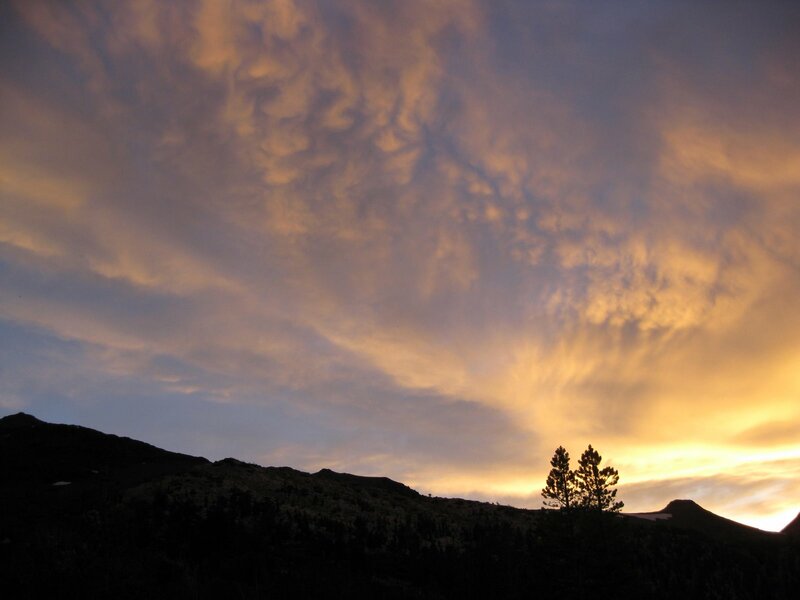 Trees at evening–high in the canyon of the E. Fork Carson on my birthday. 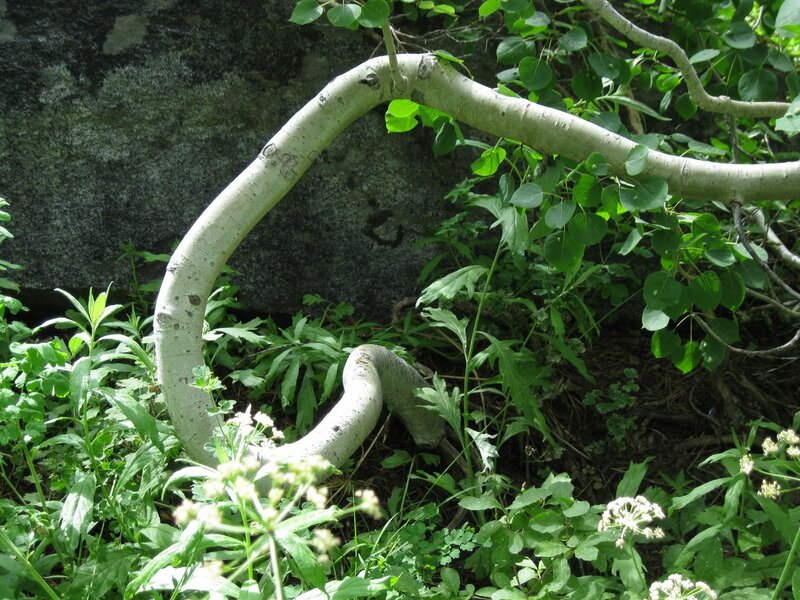 This little aspen is having a tough time going vertical with the heavy snow loads in the Tahoe area. But this big lodgpole above Carson Pass hasn’t had it easy either. Near here I weathered an intense thunderstorm with flashfloods and big hail that churned a nearby lake into a froth and knocked unripe cones down by the gazillion. 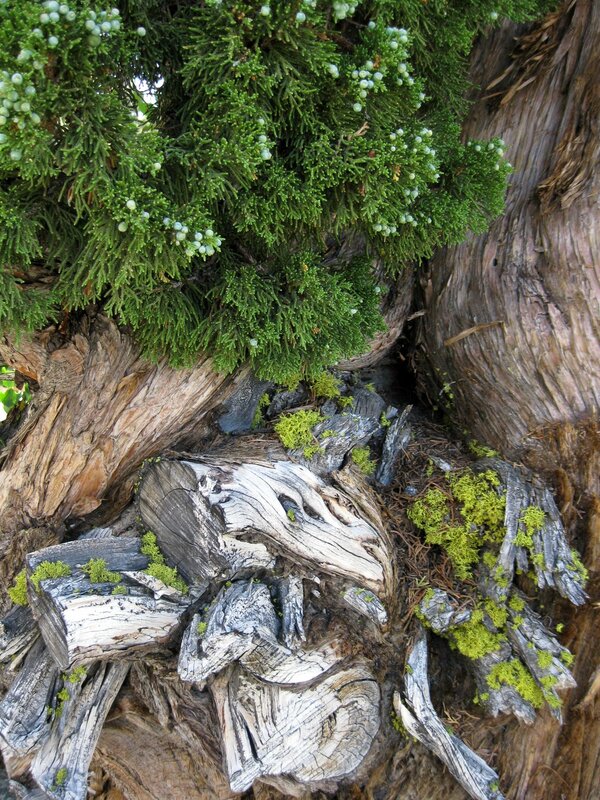 I love junipers. One of the first big ones was just a couple miles up trail from the little aspen. 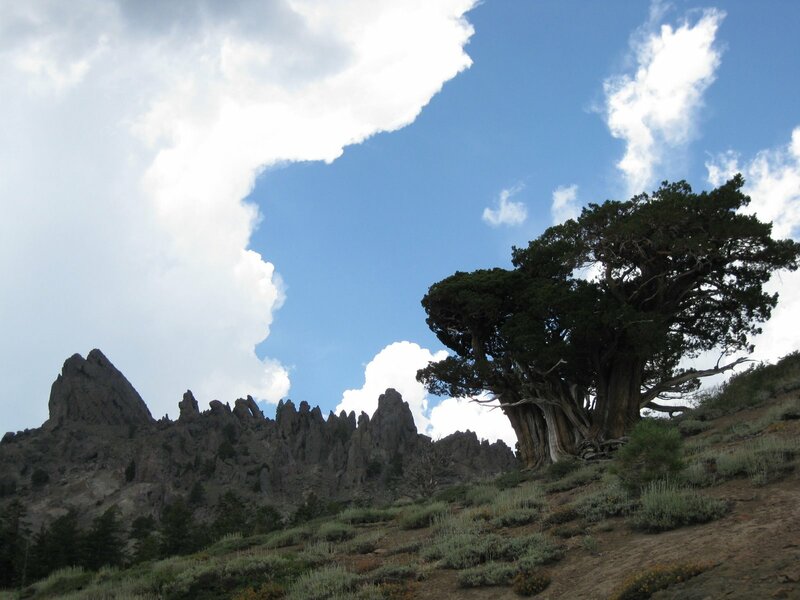 Many beatiful junipers grow in the crazy volcanic landscape between Carson and Ebbett’s passes, south of Raymond Peak. They are nice up close too. …what (or who) you’re going to find along the road. 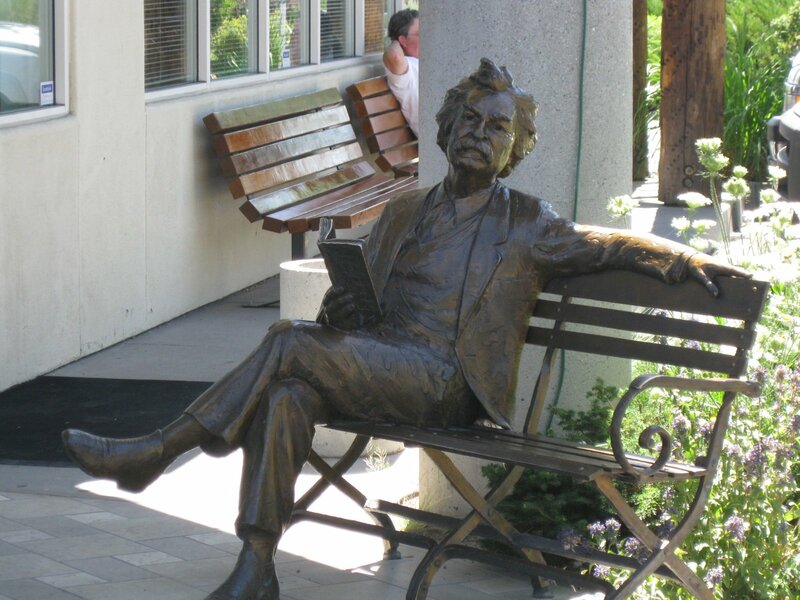 For instance, Samuel Clemens himself (and friend) kicking back outside a gas station convenience store on a hot July afternoon near Reno Nevada, listening to a latin/jazz guitar version of “What Child is This”. I felt a little silly snapping a picture at a gas station, but Clemens didn’t seem to mind. 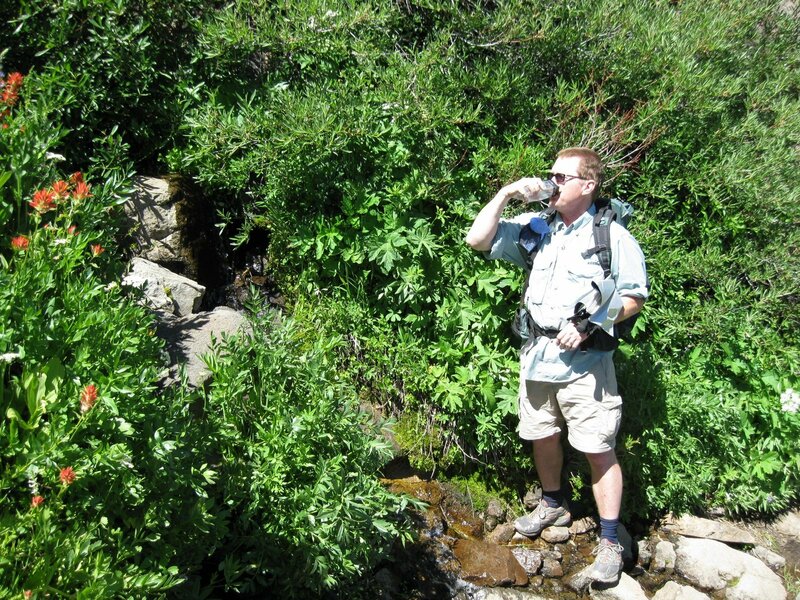 A brief tutorial on the fine art of drinking water from a mountain spring. First, scoop up some water. 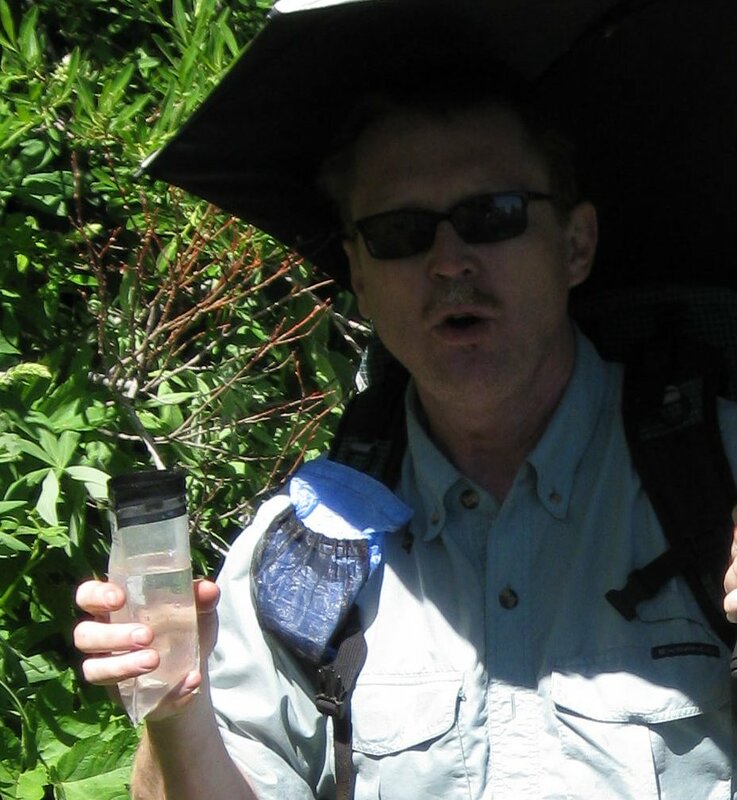 I use a small plastic bag, which works with very shallow sources–look for where water is slipping down an sloped rock and press the bag to the surface. 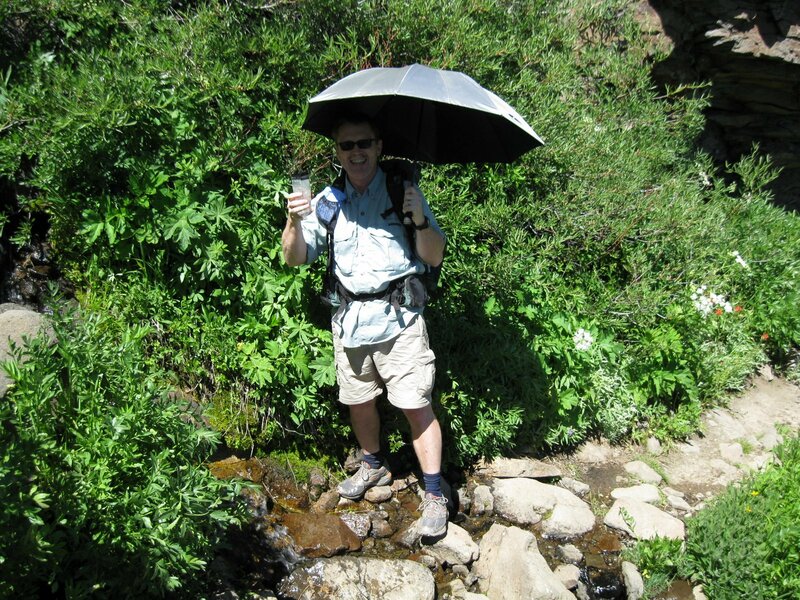 It was sunny and hot this day, hence the trailside fashion that caused Brian’s kids some embarrassment. That’s Mr. Patrick Poppins if you please. 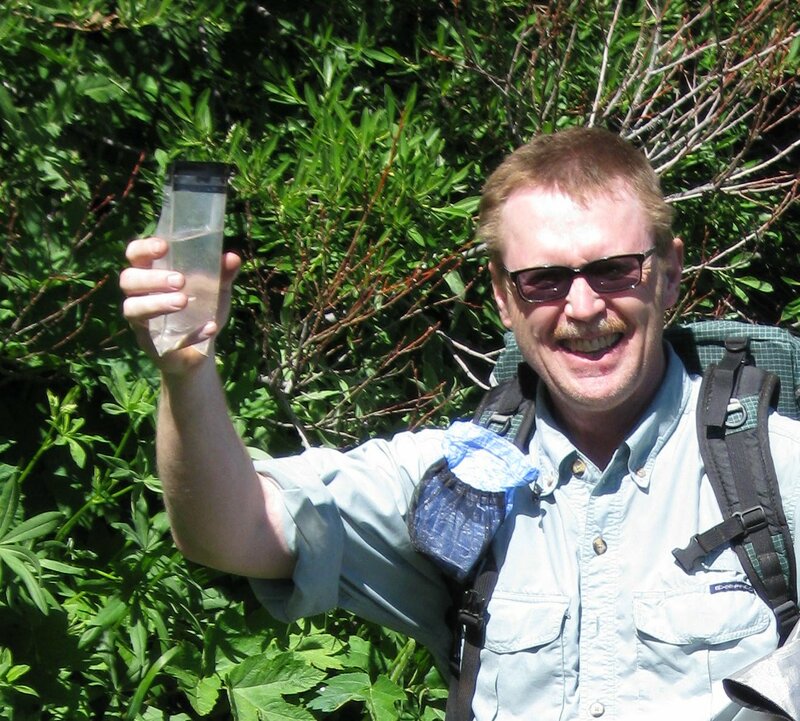 Hmmm, wonder if this has giardia…? Clear, cold, and coming right out of the hill is good – Cheers! Try not to let water run all over your face. The plastic bag is not always ideal as a cup, but Brian has respectfully zoomed out to conceal any evidence. The blacksmith in this case being Peter Lassen, and the mountain Lassen Peak. Tangentially, Megowan means “son of the blacksmith”, though some sources suggest this is not in Danish. Done hiking the Klamaths (until another year), it is on to the southernmost major peak of the Cascades. 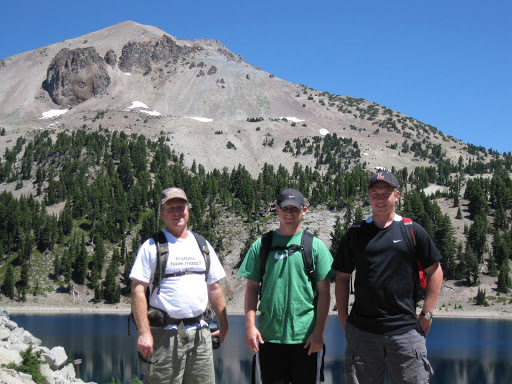 Here are my brother-in-law Brian and his sons Matt and Kyle in front of Helen Lake, w/Lassen’s summit behind. Matt and Kyle are very strong; I think they should have carried us, but it didn’t work that way. 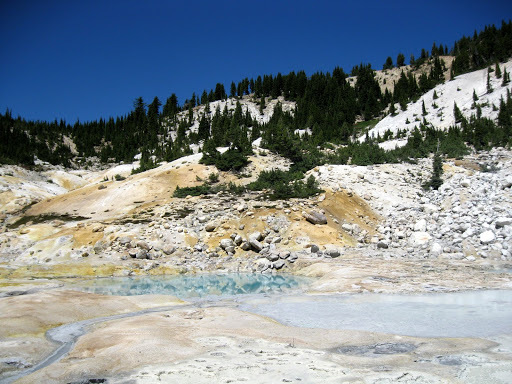 The following day we climbed Lassen, a bit over 2000 feet of ascent on a scenic and generally well graded though exposed trail. From the summit plateau you could see Mt. Shasta far to the north, a final trailside view of the mountain I spent the last two and a half weeks skirting via the Klamath Mountains. This lovely view is currently obscured by smoke from a complex of fires just to the north, and the summit trail is closed. The black lava in the picture’s middle ground is allegedly the most recently created rock in California, black dacite from the 1915-17 eruptions. Other quartz-speckled dacites near the summit are brown, gray, yellowish, and even a dusty plum. 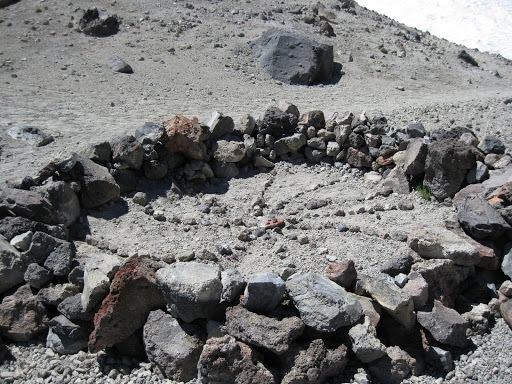 Even on these dry and inhospitable slopes there were occasional bright patches of flowers blooming post haste in the short growing season. A crop circle, proof of aliens!